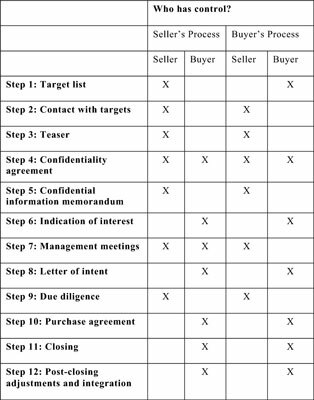 Typically, Seller has a lot of power early in the M&A process. As the party being courted, Seller controls whether meetings occur and whether information is exchanged. One way Buyers can get more power early in the process is by submitting a pre–emptive bid, making a bid before other Buyers have made their bids and knocking out all other possible suitors. Eliminating competition is a boon for any Buyer and puts Seller in a vulnerable position. If Buyer subsequently decides against closing a deal, Seller has lost time otherwise spent talking with multiple Buyers and thus finds itself back at square one. Even without a pre-emptive bid, the power balance swings toward Buyer when the parties sign a letter of intent (LOI) with an exclusivity clause. At this point, Seller can no longer speak with other Buyers. If Seller accepts a pre-emptive bid from Buyer, Seller should insist on removing the exclusivity clause from the LOI. Short of that, Seller should include language in the LOI that ends the exclusivity period and allows the Seller to speak with other Buyers in the event that Buyer attempts to change the price or terms of the deal. From the signing of the LOI through closing, Buyer most often calls the shots. However, the longer the due diligence and purchase agreement drafting takes, the more the power may shift back toward Seller because Buyer is investing more and more money as the process goes on. Some Buyers, most notoriously private equity (PE) firms, retain advisors whom they pay after the deal closes. The longer the process takes, the more those bills accumulate. PE firms typically pay those bills with the proceeds from the closing. And guess what? The PE firm managers making all of these decisions probably don’t have the money at ready access; they need to request cash from various sources (the fund itself, the fund’s limited partners, and other lending sources such as banks). Hi, boss. Bad news. The deal is no more. It has ceased to be. The deal expired and has gone to meet its maker. It’s an ex-deal. Can I have a couple hundred grand to pay off all the professional services firms that did all kinds of work on this deal that turned out to be all for naught? As you can imagine, that’s not an enviable position to be in. Following the power during the M&A process.